The health history forms are handy when somebody wants to have a full assessment of the medical and health condition of a person. It could be a clinic need to know about the overall situation of a visiting patient about to take treatment. It could also be a scouting setup which needs to have a full idea of the health situation of the aspiring scouts to check whether they are eligible for scouting training or not. You may also see Health Forms. 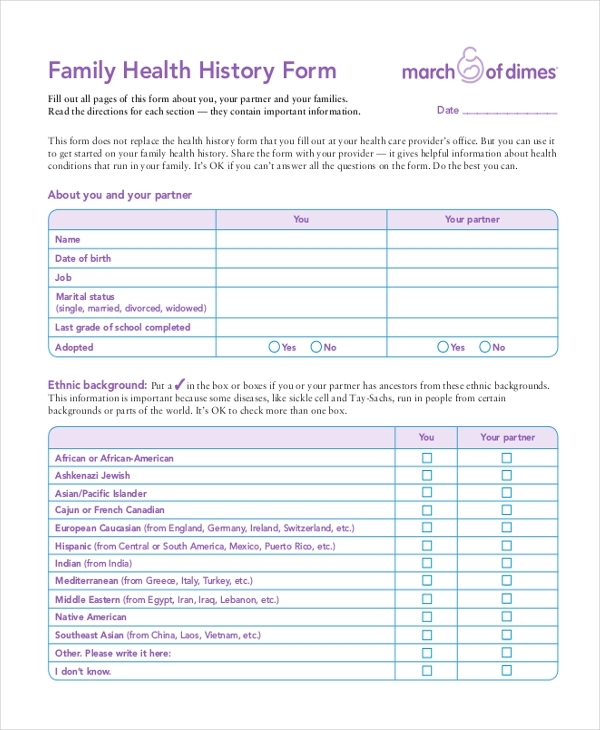 You have a comprehensive health history form here which allows you to furnish information both about you and your partner. It starts with a table of basic identity data on both of you, followed by your ethnicity, detailed data on medicines and supplements that you take, any harmful substance that you consume, health conditions and more. 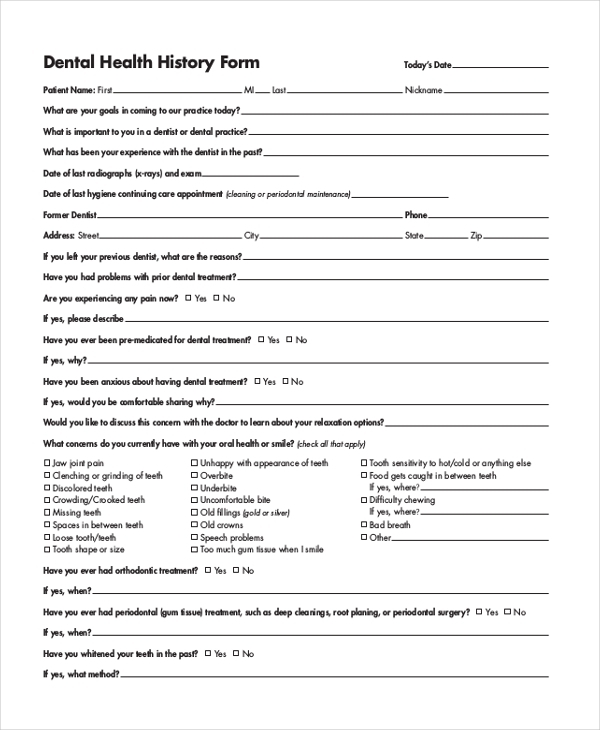 If you are looking for health history forms for your dental clinic, this extensive form here would be great for you. The form comes with a long list of sections including data on the former dentist, last dental maintenance, the health concerns faced by the patient currently, information about teeth whitening and so on. 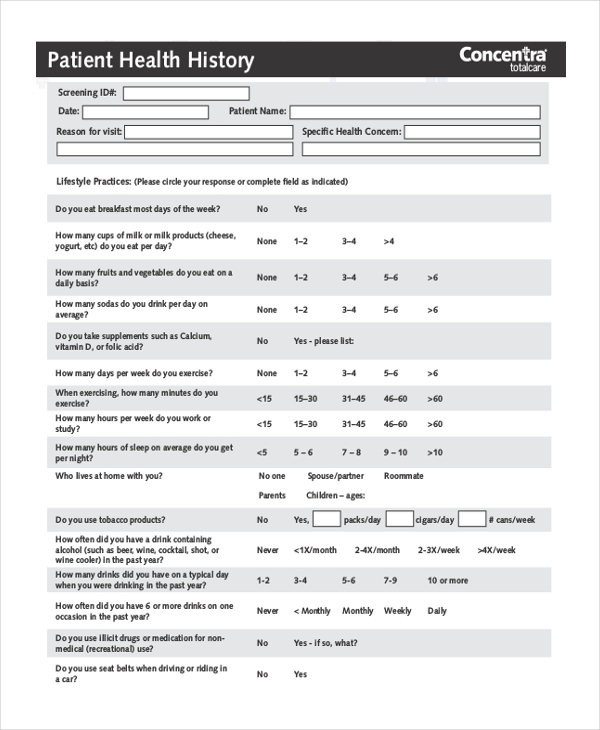 If you are on the look out of detailed health history form, this form here would be really cool for you. The form comes up with details on the patient’s breakfast habits, milk products consumed, exercise habits, consumption of tobacco products, medical history etc. Moreover, there is also a list of different health issues faced by the patient (if any). 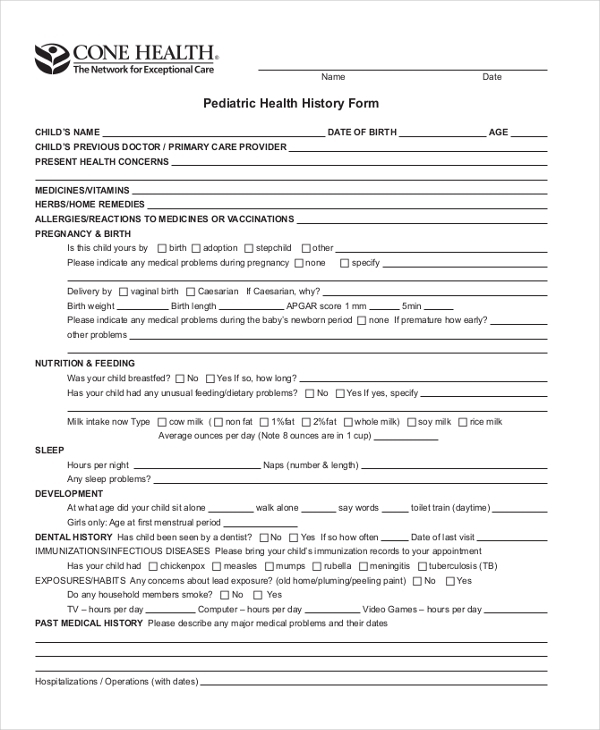 This pediatric health history form comes with all the needed sections you would need about the kid visiting you. These include the child’s primary care provider, medicines consumed, nutrition and feeding, allergies to vaccinations, sleep, development, dental history etc. The form also contains sections on previous medical history, family history, review of organ systems and so on. 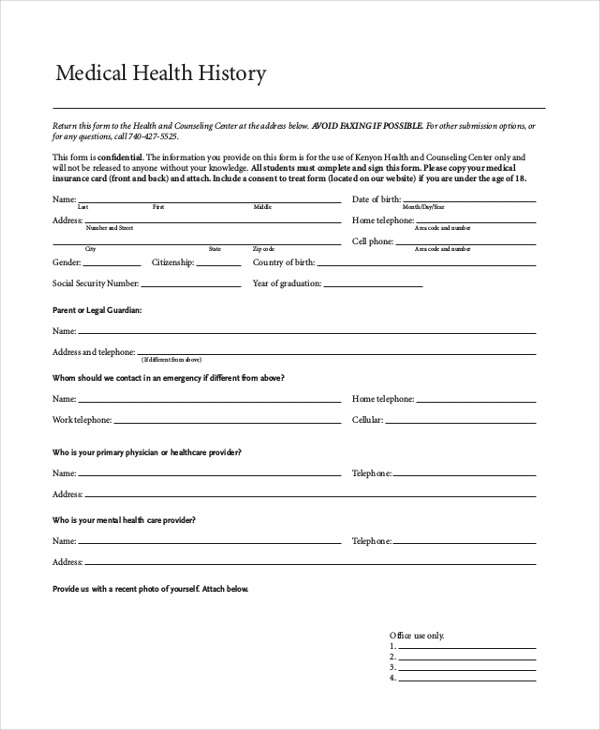 This medical health history form would be useful for any college offering medical services to students and it begins with a thorough discussion of the importance of such forms. Then, you have sections on the medical checklist, current immunizations and a detailed form on the medical history of the student. The form also contains information on the guardian and primary physician. You have an extensive student health history form here which begins with basic identity data of the student. It is then followed by information on health insurance as held by the student, family history, medical history as well as immunization record. The last part of the form is dedicated to TB screening questions. If you are in search of health history form to be used by electrologists, this history form is just the thing that you need for your patients. It comes with a list of areas that the patient needs treatment of, the hair removal methods used, information on medications, previous and present treatment for health issues (if any) and so on. 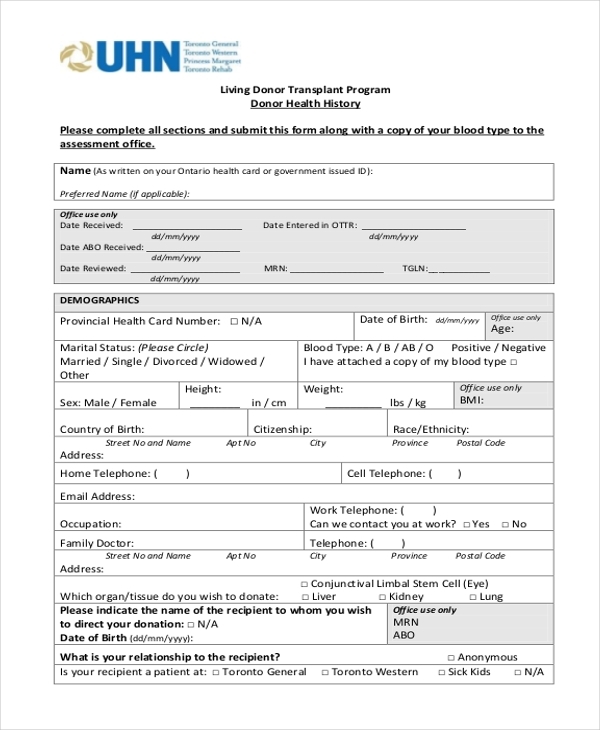 This history form would be useful for organizations taking organ donations. It is packed with all the important data that an organization would need from the interested donor such as the organ he wishes to donate and to whom, the time of donation, whether the recipient and the donor’s family know about his wish to donate etc. The form also includes sections on the detailed medical history of the donor. 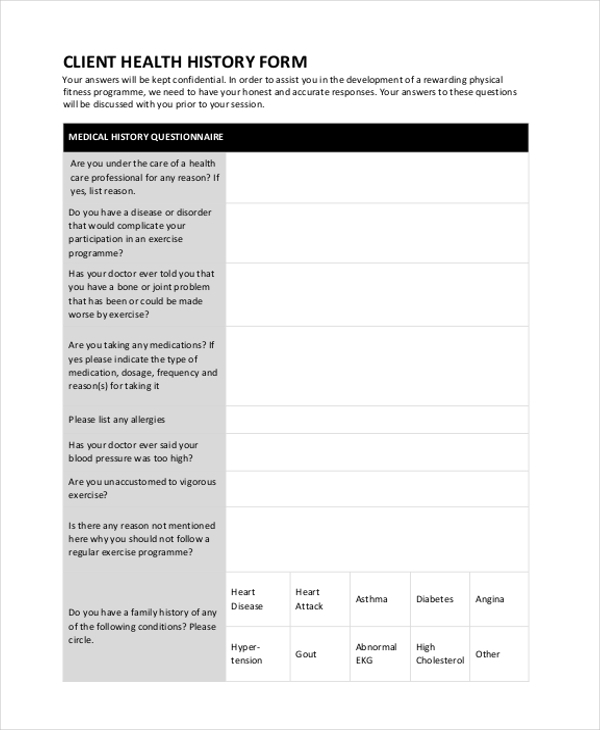 If your fitness center needs health history forms of members to ensure the most compatible fitness training for them, this history form is the thing you need now. It comes with an extensive list on the history of all kinds of bodily conditions of the member- like general medical history, musculoskeletal condition, heart as well as nutritional information. 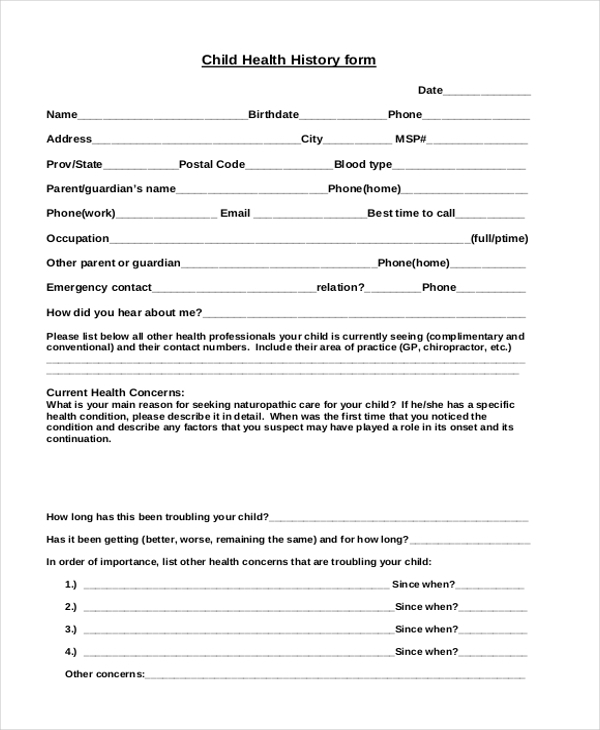 You have an elaborate health history form for children visiting your clinic. The form has arrived with all major relevant sections such as -present health concerns, medications, treatments, pre-natal history, natal history, neonatal, health issue after 1st year, nutrition history, vaccinations, growth and development, family history, current living environment and so on. What is The Purpose of Health History Forms? The main purpose of health history forms is to get a complete idea on the medical and health condition of the individual. The history data would be helpful in assessing the most compatible treatment for the individual, based on his previous and present situation. Sometimes, these forms also help to establish whether the person is suffering or likely to suffer from any sort of issue related to his ethnicity or family such as diabetes. Besides, another purpose of health history form is to check the eligibility of the individual for certain activity or program. Thus, you have BSA health form that helps the scouting body to assess whether the aspiring scout is to be included in scouting, in terms of his previous and health situation. You can also see Health Certificate Forms. Who Would Need Health History Forms? The health history forms would be required by any organization which needs to evaluate the health condition of the patient. Thus, clinics or health care centers always require such forms for every patient who comes to their setup for treatment. Thus many academic institutions offer health and counseling services, they too would require these forms. Besides, insurance agencies also need health care claim form as it enables them to check whether the client is fit for their health insurance package, in regards to his health. Last but not the least, the scouting establishments like BSA as well as organ donation foundations are greatly benefited by these forms. What is Covered by Health History Forms? The health history form covers all the major health information of the individual filling the form. It generally begins with the basic identity details of the person. Then, it goes on with sections on the medications taken by the person, history of any critical health condition, any health issue he is suffering from currently, family history, ethnicity background, the vaccinations taken, infection risks etc. Moreover, many health history forms even contain the number of the person’s primary physician as well as the person to be contacted during an emergency so that one can contact them immediately when the patient is in some crisis. You may also see Health Risk Assessment Forms. The health history forms is an elaborate document that is really daunting to create all by own. However, you have the easy solution of health history form samples online today that offers you complete readymade forms that you only need to customize with your typical data. Whether you need such forms for your clinic or college, the samples above would be really cool.